Wow! These speakers sound great. I had been listening to them uninstalled in cabs out in the workshop, hooked up to "B". Of course I have shop speakers hooked up to "A". When I first heard them in the cabinets I thought something was wrong with the amp's A/B switch because they sounded so good I thought I was listening to the "A" speakers. Sure enough, though, after a bit of A/B switching I regained my focus and could hear that the only thing lacking was the very low end. The wife was out for the evening so I crawled up in the attic and ran the wires I needed to install these in the living room. Before she left I got the location approval. They have now replaced the two Cerwin-Vega monkey coffins you see in the photo. The plan is to get rid of them, along with the cabinet designed to house the old HDTV's that were two feet deep and weighed a ton, and hang the TV on the wall. I thought that this change would accommodate the wife's request for a new furniture layout at the expense of some sound quality. But I now I see, and she even agreed when she got home and heard them, that this is an improvement in sound quality. I'm getting better stereo separation, and sonic clarity. Right now the sub is hidden behind the TV and when we finish with the furniture change it'll be in a better location, so I'm looking forward to that improvement, too. These are nice little speakers, Scott. You made a great design. As you said, they are not efficient, so people who like it cranked will need power. At max volume on my system they are louder than any listening I ever do. Last edited by Herman Trivilino; 12-21-2014, 09:26 AM. Herman, thanks for leading the way here. I am a little ways behind you and your pics really help keep me on track. Hey Scott, have you thought of designing a MTM version of the Helium? I think it would make a good center channel. Maybe I could hang it on the wall below my TV. My initial thought was that these were so small that most people would just use a TM as the center. An MTM is possible and I am willing to do it. There won't be a knock-down cabinet kit for it (at least initially). I hadn't thought abut using the TM as the center. Wouldn't a MTM be better? I'm thinking a cabinet as shallow as possible so it could be hung on the wall below the TV. Perhaps put the port out one end. Now that we have the Heliums as the front speakers, she thinks the center channel is too large. An MTM is possible and I am willing to do it. There won't be a knock-down cabinet kit for it (at least initially). I would really like to build it. I want to order parts to build another pair of the Heliums as I already have the cabinets built, and I'd like to include the parts for the MTM in the order. I assume the crossover components will be entirely different? How does that rock hard water putty work on speakers like this? Is it durable? I am thinking of trying it on my next build. Well, back when I was a carpenter it enjoyed a good reputation because it dried fast and was somewhat stainable. This is the first time I've tried it in years. I bought it a few months ago when I was remodeling my kitchen and since I had some left over I used it to fill in the "end grain" of the plywood where I rounded over the corners. It did a great job. Of course I painted these cabinets, I wouldn't use it if I were staining. It does seem to have a limited shelf life. This can was opened a few months ago and now when I mix some up it doesn't dry as fast as it did when it was new. What are your thoughts on my center channel issue? We're really happy with the Heliums as front mains and are now looking for a smaller center channel. In order to make an MTM, you would wire two of the ND91-4's in series (wiring them in parallel gives too low an impedance). This doesn't change the sensitivity, so it appears that you might get away with the same tweeter crossover. For the low pass (connected to the woofers), a starting point would be to double the value for the inductor (2 mH) and resistor (4 ohms), while cutting the tweeter value in half (2 uF). My thought on box size would be 4.5" tall by 10" wide by 6" deep. The port should be tuned to a similar frequency (which will be a shorter port given the larger box). Having not built and listened to it, I can't guarantee it will be spot-on, but it should be close. First, thanks for this exceptional micro design. It will do really nicely on my desk at work. Second, I am sorry that I mis-spelled your last name in my post of my Helium build. Doesn't seem like you can edit titles...sigh. Just wanted to add a pic of the set I finished earlier today. They sound fantastic. These look great, and with the flat pack... not too difficult either. How do these compare to the overnight sensations?? I know they are different and maybe both serve a slightly different set of needs, but how do they compare? I like how easy it is to mount the nd91 and the nd16... big plus there too! Just wanted to add a pic of the set I finished earlier today. Really nice craftsmanship, Andy. I like the way you flared the port tube opening to the same diameter as the tweeter. Did you mount the woofers to the back side of the baffle? Yes, I rear-mounted the woofer to show as much wood as possible. I recessed from the rear about half the thickness of the baffle to get the woofer as close to the original alignment as I could and then through-bolted them using M4 (I think) machine bolts. Andy, those look great. 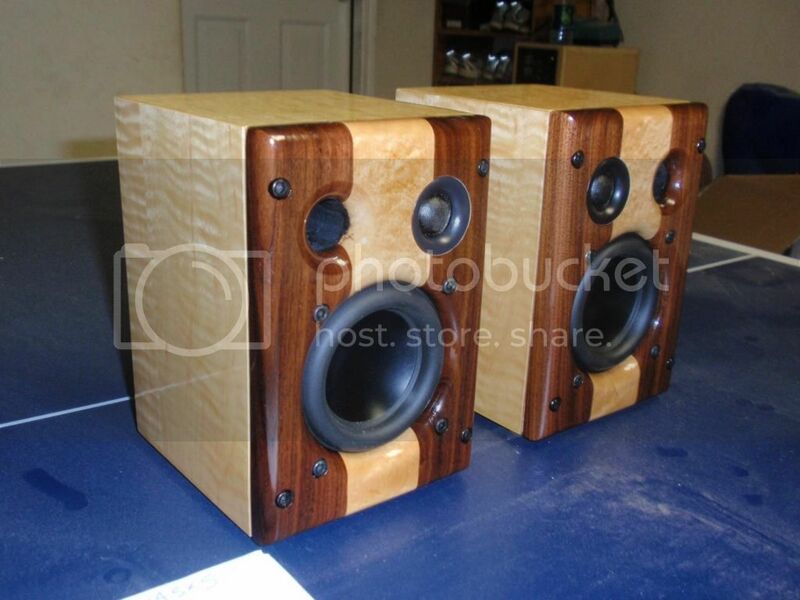 What are the speakers that they are sitting on? Those are Mzisserson's New Horizons, another great design. Obviously, a bigger design and very nice sounding, but at least for me, way too big for desktop speakers at work. With the same tweeter and the little brother of the woofer, there are similarities to the sound. Both are impressive.